Have you ever gotten the impression that a character was strong but also scary, heroic but somehow hapless, from just one glance? This happened because an artist designed a successful character. These artists are Character Designers, and they work in every fictional medium, from comic books and cartoons to television and movies, to build and create the characters you know and love. They outline everything about the characters and work hard to convey their strengths, weaknesses, and personality in their appearance. 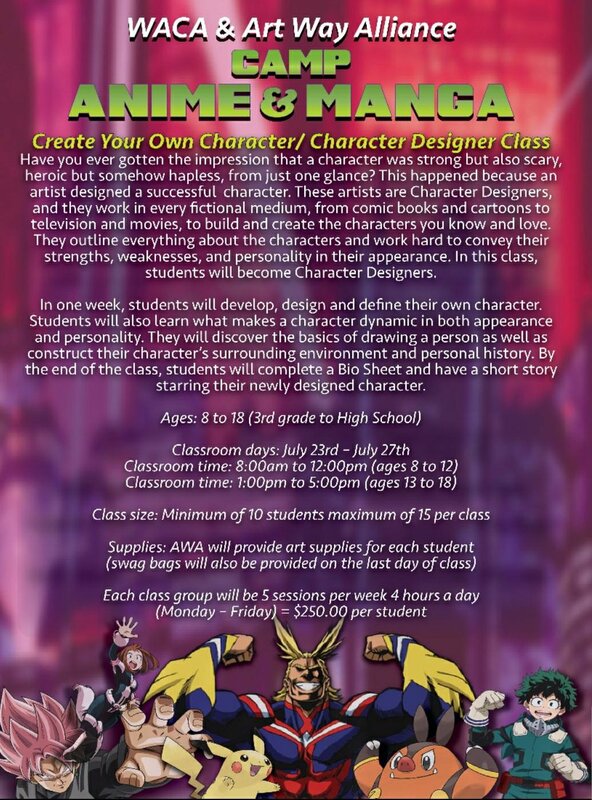 In this class, students will become Character Designers. In one week, students will develop, design and define their own character. Students will also learn what makes a character dynamic in both appearance and personality. They will discover the basics of drawing a person as well as construct their character’s surrounding environment and personal history. By the end of the class, students will complete a Bio Sheet and have a short story starring their newly designed character. Classes are $250 for each student, aged 8 - 18. Art Way Alliance is offering two class sessions, with a minimum of 10 students and a maximum of 15. To sign up, contact WACA online or via phone at 443-584-6002. Feel free to contact Art Way Alliance at artwayalliance@gmail.com too!